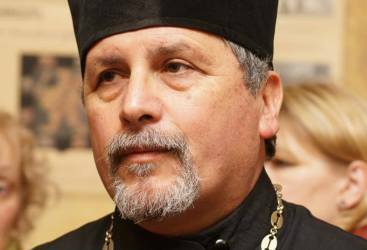 Fr Alexei Aedo from the Russian Orthodox Mission in Chile is in dire financial trouble. Two years ago, Fr Alexei Aedo Vilugron was getting by quite well, supporting his family and working on growing a mission in Santiago. Thanks to the support of donors like you, we even bought him a car, so getting to church would take less than two hours. But then, he heard how much interest there was in the Orthodox Church in the South of the country, and he felt that God was calling him to serve his people in Concepcion eight hours away from Santiago. His plan was to teach Philosophy at local universities. But when the university authorities found out that he is an Orthodox priest, they denied him the position. This happened several times. The new mission in Concepcion is blossoming spiritually, but not financially. Father is a modest man and never gives up. So he keeps looking for a job. For the last two years he has been barely making ends meet - but only thanks to the support of FFA donors like you and two generous donors in his new small parish. But after the economical situation deteriorated in Latin America, Fr. Alexei’s situation has become dangerous. In Chile, if you have debt, you are slammed with additional fines, penalties and in some rare cases – imprisonment. Father Alexei has four people who rely on his support: his wife, two children and a grandchild. And over 20 people – most of them recent converts from Catholicism, who need his spiritual guidance. If we do not remedy Fr. Alexei's situation, he is in serious danger of losing all his posessions. This is why I am writing to you today: to beg you to help this wonderful priest, father, and grandfather! Our goal is to pay off Fr Alexei’s debt and support him for a year. Fr. Alexei is confident he will be able to find a stable job by then. Fr Alexei’s monthly expenses are $1,500 per month. $250 will pay for his monthly bills. $300 will pay for one month’s rent. But any sum will provide relief to Fr Alexei and his parishioners. Remember, if you contribute any amount to help Fr Alexei, you are keeping a parish open. Please help a priest in need! P.S. We are directly commanded to take care of our priests. What would the Apostle Paul say to us if we let one of our priests go to prison, because we couldn’t take care of his basic needs? !